When Blood Sun enters the battlefield, draw a card. All lands lose all abilities except mana abilities. 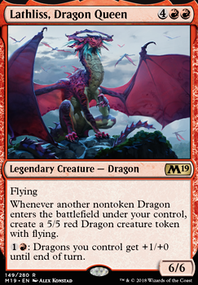 I like a lot of red enchantments, like Blood Moon , Blood Sun , Burning Earth , Curse of Opulence , Mark of Fury , Stranglehold , Sunbird's Invocation , Vicious Shadows , Widespread Panic , Predatory Advantage , and two Theros Gods. the reason not to run fetches is that they do not thin your deck by any significant amount, and you do not need the color fixing. Price of Progress and Blood Sun are certainly not bad in edh. they are very high quality cards. 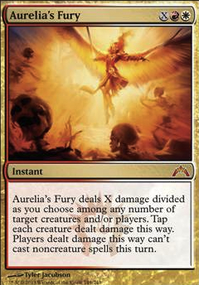 Price of Progress is used a lot in legacy, and in commander its potential for damage is even higher. @vomitpile - No issues with mana, 24 is a lot. 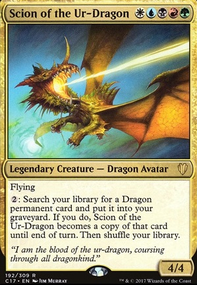 The main issues I run into are that our turn 1 and 2 are a little slow if we don't draw an Amulet of Vigor , but a turn 3 Blood Sun or Chalice really wrecks a ton of decks in Modern. Hi, first thing I noiticed is that you have only one point removal on instant. 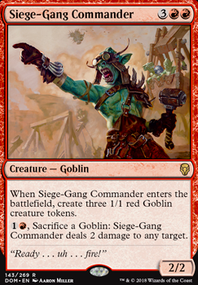 My meta shifted to more competetive recently and I had to disrupt very fast voltron commanders like Rafiq of the Many . Try these: Rapid Hybridization , Pongify , Reality Shift , Krosan Grip and Cyclonic Rift <- this card is great, because in early game you can buy some time, cascading into it isn't bad, but casting it from hand with overload will hurt your opponents so much (casting it at end of opponent's turn means no blockers). 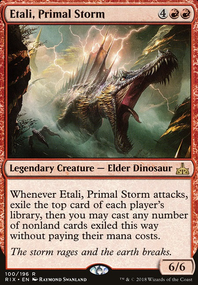 Try out Thunderfoot Baloth - trample and +2/+2 to all creatures is sweet, and Selvala's Stampede - after first commander cast you won't have mana to play cards from hand, this card allows to put permanents (not only creatures) and one is guaranteed. Putting creatures from library is also very good. Magus of the Mind if you have one blue mana left after cascades you can sacrifice him (Wanderer gives him haste) and exile 4 cards from top and play them for free (try it out with Strionic Resonator or clones if more mana is avaible)! Look at Kessig Wolf Run - with commander on battlefield and no cards at hand still you can be dangerous. 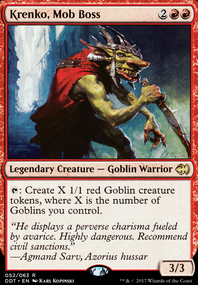 I don't know why you use: Domri Rade - his first ability is some kind of draw but it won't work in every case, second ability is on sorcery speed and that could be too late, Blood Sun distuption isn't very harming and cascading into it would give nothing. 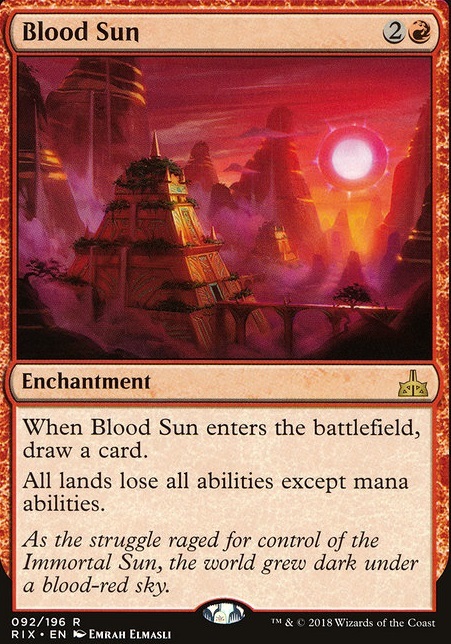 In decks that run a lot of gates, Blood Sun is great. It essentially turns all of your lands into the original duals like tiaga lol. I would probably pick a theme and stick with it. Either make a full on gates deck, a jund midrange/control deck with normal mana, or a rackdos/BRx deck centered around captive audience. Blood Sun is pretty great in the side board, as it just shuts down a ton of decks and fetch lands. Honestly, I could see a build of this where you run a few in the main board if you knocked down your number of fetch lands a bit. 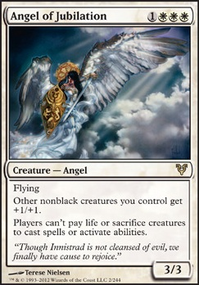 It hits basically every deck, and totally shuts down Tron and Valakut and many other archetypes.